Hey folks! I am feeling much better; I rested up over the weekend. I did not know how poorly I was until I didn't feel like that anymore. This week I am taking it easy on the home, house, family front - if it is on the floor,then it might have to stop there for a while. Today I did a half day and then promised myself some sewing. 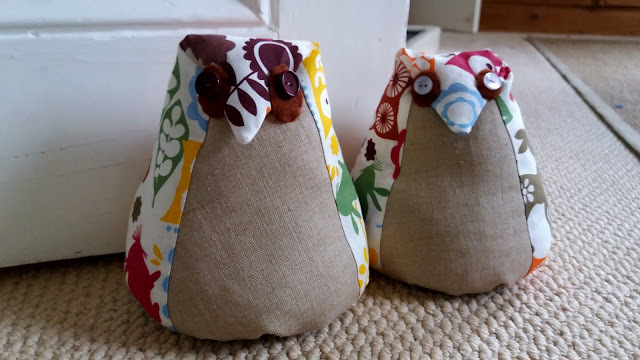 Little doorstops were already cut out and ready to go. 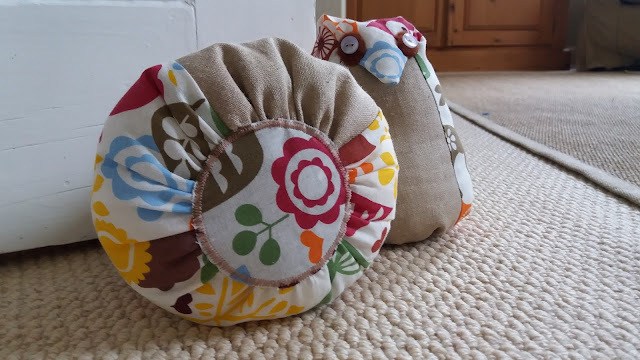 These little door stops were easy to make. They have bags of rice inside to weigh them down. It is just a triangle sewn on to a cone shape and then gathered at the bottom. The base is an interfaced circle which has been satin stitched on the machine then hand sewn over the hole. The pattern came from this book. It has some nice present ideas in but the instructions are not always very clear. They feel like they have been translated into English therefore a little disjointed in places, however if you see it in a bargain bin for a pound it is definitely worth it for the ideas. They're so cute! I love the beaks on them. I think I've seen that book around. Maybe it came up in a suggested title on Amazon based on other book purchases? I don't remember. It looks nice, though. I'm so glad you feel better. Take care and take it easy! 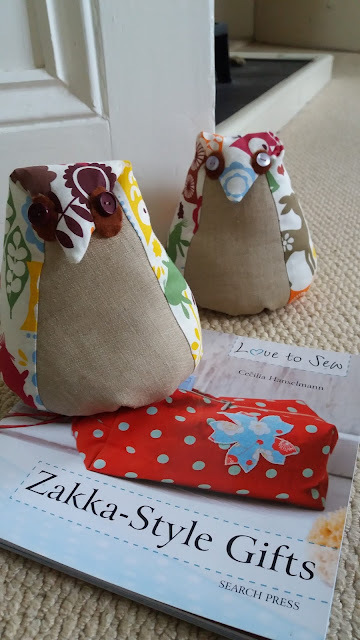 I love these, they are so cute and make perfect presents. These are sweet, you've made them beautifully. Oh those are so sweet Jo well done. So glad that you’re feeling better. These door stops are going to make someone very happy, Jo, they are super sweet. Good to hear you are feeling better.